A loan of $1,225 helped a member to purchase a solar light, as well as hybrid seeds and fertilizer, to improve her maize harvests. Lydia's Group was formed by 12 farmers in Webuye District and is being represented by Lydia, who is the group leader, pictured above. She is 25 years old, married and has four children. Lydia has been a farmer for 18 years and is often referred to as a very experienced farmer. Lydia isn’t new to One Acre Fund. She actually joined the program in 2014 and has since noticed her life has changed, especially in the sense that she has been able to consistently feed her family ever since. 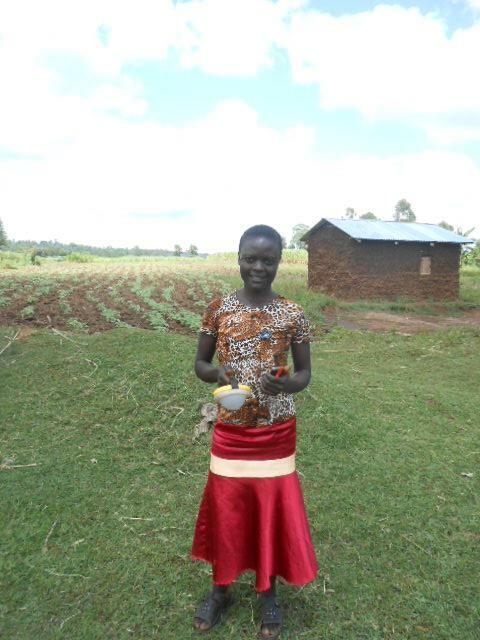 This year, Lydia will not only get fertilizer and maize seeds as part of her loan, but will also purchase a solar light. She is very excited about this addition since now she will be able to reduce the consumption of paraffin fuel and therefore save more money. Using this loan, Lydia's Group will purchase a total of nine solar lights and use the farming inputs received to plant a total of 6.75 acres. This loan is part of One Acre Fund's integrated agricultural package, which provides groups of smallholder farmers with seeds and fertilizers on credit, onsite agricultural training, and insurance options. Borrowers also have the option to purchase solar lanterns as part of the loan package. To give borrowers more flexibility, One Acre Fund permits them to switch groups, drop out of the program and change their loan amounts before receiving their inputs. To accommodate this, Kiva allows One Acre Fund to post loans for groups that may change in size and membership. Only the group leader is featured in the photo, representing the loans for each of his or her individual group members. If a lender makes a loan to group containing a borrower that drops out, the lender will receive the full loan amount for that borrower back at the end of the harvest season. If the lender makes a loan to a group containing a borrower that decides to take a smaller loan amount after the loan is funded, the lender will receive the repayments from the smaller loan amount plus the full difference between the two loan amounts at the end of the harvest season. This Kiva loan will be used to provide borrowers with needed goods or services, as opposed to cash or financial credit. With this loan, One Acre Fund will purchase fertilizer, seeds, and other important farming inputs to distribute to this farmer group during Kenya's next planting season in February. This distribution of farming inputs is part of One Acre Fund's integrated agriculture package, which includes training, reliable input supply (such as fertilizer and seeds), credit and insurance. Clients enroll between July and October for the following planting season, which begins in February. By purchasing inputs during these months, One Acre Fund is able to take advantage of the historically low farm input prices during this time of year in Kenya. Members of One Acre Fund form groups in which each borrower guarantees the loans of all other borrowers in the group. One Acre Fund differs from a traditional microfinance institution, however, by allowing groups to split before the delivery of inputs at planting time. If a group were to split, each of the two new groups would have fewer members that could support a delinquency or default from a member. This may represent a different risk than that for a traditional MFI’s group loan. As a maturing but early-stage organization, One Acre Fund continues to require funding from organizations like Kiva in order to provide its package to farmers on loan.